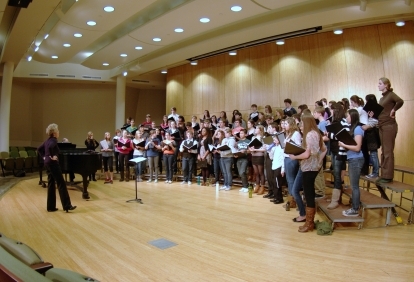 PYC welcomes all students who love to sing and have an interest in developing their voice and choral artistry. We have a choir for every student: those who are just beginning to sing and those who wish to continue their voice studies. PYC accepts students from Kindergarten on up. Rehearsals are held Sunday evenings at Trinity Episcopal Cathedral, 147 NW 19th Avenue, corner of NW Everett St. in Portland. Yearly Tuition (see below) plus additional $100 annual singer admin fee. We have a 3-tier tuition fee structure. 100%, 80% and 60% tuition amounts are listed, families choose the option that works for them depending on their financial circumstances. If these amounts still pose a financial burden families are asked to fill out a scholarship form. Tuition partially covers salaries, music, operational costs, etc. Costs for uniforms and for travel to national and international festivals are the individual student's responsibility. All tuition payments are due by the start of the season. PYC offers limited scholarships so that all interested and qualified singers are able to join the choir. Choir Dress, the concert attire for young women, costs $85.00. Dresses are kept at the office. Call to come in and try some on. Tuxedo, the concert attire for young men, is purchased independently. Nova and Music Makers wear long sleeve, white shirts/blouses with black pants/skirts and black socks/tights and shoes; all are purchased independently. Work Uniform, a blue polo shirt with the PYC logo, costs $14.00. The polo shirt is worn for workshops, informal performances, and other occasions when the formal uniforms are not required.